Revisiting Newt Gingrich's 1997 Ethics Investigation This week, House Minority Leader Nancy Pelosi suggested she might release details of the 1990s ethics investigation into then-Speaker Newt Gingrich. An investigative committee, on which Pelosi served, concluded that Gingrich had used tax-exempt funds for partisan purposes. 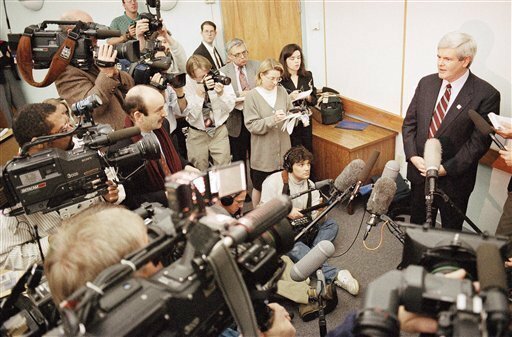 Then-House Speaker Newt Gingrich holds court at Reinhardt College in Waleska, Ga., March 11, 1995, after teaching his final class at the school. The 10-week course was criticized as a partisan forum for Gingrich, and became part of a House ethics investigation against him. Even as Republican presidential front-runner Newt Gingrich is riding high in the polls this week, he's been dragged back into a debate over a problematic part of his past. In 1997, he was the first speaker of the House, ever, to be punished by the House for ethics violations. With "Renewing American Civilization," history-professor-turned-politician Newt Gingrich had a college course — a program that was supposed to be insulated from partisan politics and campaign cash. The litany he used in the classroom sounds much like one he uses today. "American civilization cannot survive with 12-year-olds having babies, 15-year-olds shooting one another, 17-year-olds dying of AIDS, and 18-year-olds graduating with diplomas they cannot read," Gingrich lectured. But then, as now, Gingrich had several overlapping projects going on. And Democrats alleged that Gingrich used the college course to promote a political agenda. In one instance, a restaurant-industry advocacy group gave Gingrich's college course $25,000. One of Gingrich's political fundraisers solicited the money and said in a memo that the group might contribute if Gingrich would teach ideas that it favored. The chairman of the group was chain-restaurant owner Norman Brinker. Brinker was later featured in a flattering video used by Gingrich in his course to talk about business innovation: "Whether it's his beloved game of polo or his magical success in business, Norman Brinker simply does not know how to lose." Newt Gingrich handed out these pamphlets as part of the 1994 college course at the center of the House ethics investigation against him. Click on the links to view PDF copies of the notes. For nearly two years, the House ethics committee investigated this and other Democratic allegations. In the end, the House voted overwhelmingly, 395-28, to reprimand Gingrich and to fine him $300,000. "Today we conclude this case by imposing a heavy penalty on the leader of this House. It is a tough penalty, unprecedented and appropriate," Republican Rep. Nancy Johnson, who chaired the ethics committee, said at the time on the House floor. The original charges had fallen by the wayside. Gingrich admitted he had unintentionally but materially misled the committee and had failed to keep the college course insulated from partisan politics. But that's not at all the stance he takes now. Talking about the case Wednesday at the Republican Jewish Coalition, he said he should have fought back harder against the Democratic ethics assault. "The attrition effect on your members of that many ads and that many charges just gradually wore down people, and I gradually lost the ability to lead because you know, I was ultimately so battered by the process," Gingrich said. Now, there's an irony to this because Gingrich's ethics case isn't really the beginning of the story. 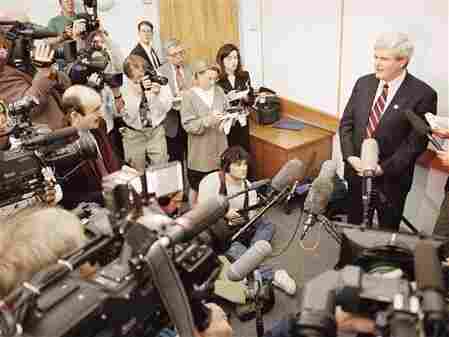 Back in 1988, as a minority-party backbencher, Gingrich filed ethics charges against Democratic House Speaker Jim Wright. His muscular rhetoric sounds familiar: "Having Jim Wright third in line to be president, and having the power of the speakership in Jim Wright's hands, is very, very dangerous to the processes we're used to in this country." Just as in Gingrich's own case, the original allegations didn't stick against Wright. But the ethics committee found other problems. But unlike Gingrich, Wright chose to resign before the committee reached a final verdict. "And that really, for the first time, kind of politicized the ethics process," says Larry Evans, a government professor at the College of William and Mary in Virginia who has chronicled the Republican rise to power. Evans says that Gingrich's takedown of Wright was a turning point in promoting the acid partisanship that afflicts Capitol Hill. "Part of the edge of the polarization at the leadership level in the '90s was because of Gingrich and the tactics that he used back in the late 1980s," Evans says. And by now, these tactics are an everyday part of the House of Representatives.